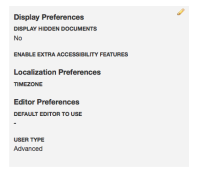 For example, go to "Preferences"
You see the "Preferences" in a box with background. That box needs a border-radius, because right now has regualr margins. For example, for "Settings" you can see that the margins are pretty stylized. Add a CSS rule for all the Profile sections to have round borders. Test your changes on multiple browsers.